Are you an Advisor that is going to accept a new Assignment or are you about to hire an Advisor for your new project? Download our Advisor Agreement template now! An Advisor Agreement is very similar to an independent contracting agreement, and the same topics should be covered. This is a suitable template that is open for discussion and negotiation. Especially focus on the Intellectual Property (IP) assignment and restriction from working with other competitors. While you can certainly adjust these clauses, you should never eliminate them. Our trustworthy Advisor Agreement is crafted and screened by a legal professional. The following 3 steps guarantee you can finish and print your legal document in minutes! After downloading and filling in the blanks, you can customize every detail and appearance of your Advisor Agreement and finish in minutes. 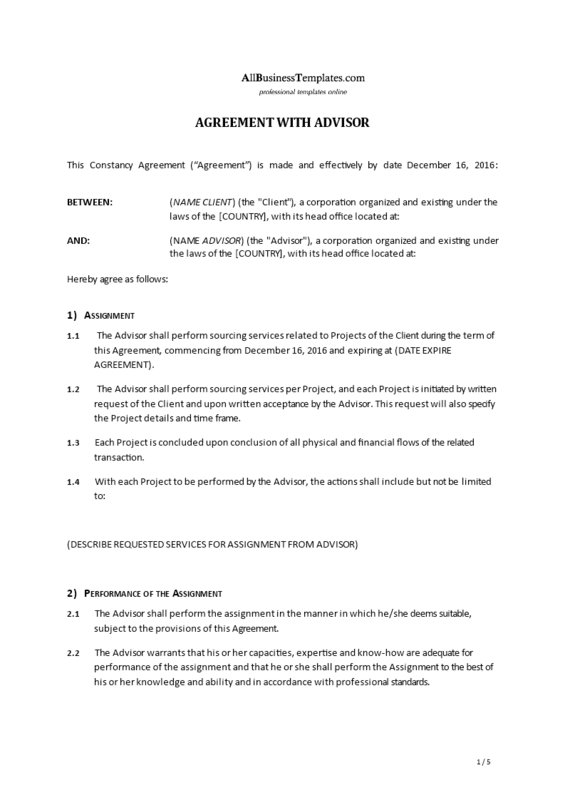 Download our legal Advisor Agreement template, fill-In the blanks, print ...done! Using our Templates guarantees you will save time, cost and efforts!